Unilever has expanded its footprint in the healthy snacks market by acquiring London-based brand Graze from the global investment company, the Washington-based Carlyle group. The company did not disclose how much it paid but many media reports claim inside info that Unilever paid below £150m for the business, apparently a sharp discount for the £300m Carlyle had expected for the business. The consumer goods giant beat bids from rivals including Kellogg’s and PepsiCo, which had expressed interest in the business. “Graze is the leading healthy snacking brand in the UK. 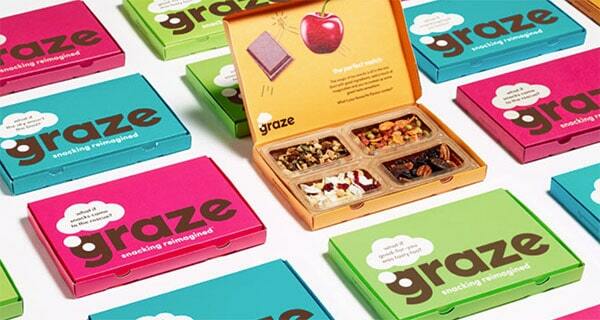 A truly multichannel brand, Graze offers personalisation, convenience and great nutrition, brilliantly meeting the needs of millennial consumers,” said Nitin Paranjpe, the president of Unilever’s food and refreshment arm. Graze was founded in 2008 sells snacking nuts, seeds, trail mixes and snack bars with no artificial ingredients. It had humble beginnings as a snack box delivery service but it now sells its products online, in stores and by targeting consumers directly through intense marketing. It was acquired by Carlyle in 2012 and the US buyout group has since grown its delivery service and expanded into retail stores in the UK and the US. Its products are now stocked in Sainsbury’s, Boots, Costco and Target. Graze is the first acquisition announced by Unilever since Alan Jope became chief executive at the start of the year. Whether or not Jope identified and steered the purchase is less important than analysing why Unilever has gobbled up Graze, notes just-food.com. Unilever already signalled its belief in the direct-to-consumer model in 2016 when it snapped up subscription razor business, Dollar Shave Club, for a reported $1bn. In food, Unilever has since announced a tie-up the UK with delivery service Quiqup to work on its Hellmann’s condiments brand and, in the US, invested in Sun Basket, the San-Francisco-based organic meal kit delivery service. In short, Unilever has had a clear interest in the direct-to-consumer business models for a number of years, and the move for Graze is Unilever’s first significant investment in a direct-to-consumer food company and is perhaps one of the first notable M&A moves in the fledgling channel by any business from a food perspective. The jury is out on what exactly could be the long-term prospects for the D2C business model in food. Coffee pods, pet food and razor blades appear, to some, to be products that fit better with subscription services than [human] food but Unilever has swooped for Graze, no doubt hoping it can learn more about D2C from a business that has managed to carve out a foothold in the channel, while, of course, there is potential for the consumer-goods behemoth to use its distribution muscle to take the brand into more conventional channels in other geographies.